Sixty years ago a football match ground to a halt when unidentified flying objects were spotted above a stadium in Florence. Did aliens come to earth? If not, what were they? It was 27 October 1954, a typically crisp autumn day in Tuscany. The mighty Fiorentina club was playing against its local rival Pistoiese. 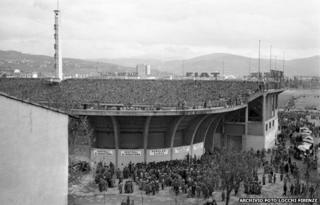 Ten-thousand fans were watching in the concrete bowl of the Stadio Artemi Franchi. But just after half-time the stadium fell eerily silent - then a roar went up from the crowd. The spectators were no longer watching the match, but were looking up at the sky, fingers pointing. The players stopped playing, the ball rolled to a stand-still. One of the footballers on the pitch was Ardico Magnini - he was something of a legend at the club and had played for Italy at the 1954 World Cup. "I remember everything from A to Z," he says. "It was something that looked like an egg that was moving slowly, slowly, slowly. Everyone was looking up and also there was some glitter coming down from the sky, silver glitter. "We were astonished we had never seen anything like it before. We were absolutely shocked." Play was suspended because spectators saw something in the sky, according to the referee's match report. Among the crowd was Gigi Boni, a lifelong Fiorentina fan. "I remember clearly seeing this incredible sight," he says. His description of multiple objects differs slightly from Magnini's. "They were moving very fast and then they just stopped. It all lasted a couple of minutes. I would like to describe them as being like Cuban cigars. They just reminded me of Cuban cigars, in the way they looked." Image caption La Nazione's headline reads: Glass fibres fall on Tuscan cities after globes and flying saucers pass by. Lower headline: The sighting over Florence (with a photograph, now lost, of the UFO). Boni has spent many years reliving that day in his mind. "I think they were extra-terrestrial. That's what I believe, and there's no other explanation I can give myself." Another of the players, Romolo Tuci, still sprightly in his 70s, agrees. "In those years everybody was talking about aliens, everybody was talking UFOs and we had the experience, we saw them, we saw them directly, for real." The incident at the stadium cannot simply be interpreted as mass hysteria - there were numerous UFO sightings in many towns across Tuscany that day and over the days that followed. According to some eyewitness accounts a ray of white light was seen in the sky coming from Prato, north of Florence. Another man who relishes the chance to speak about that day is Roberto Pinotti, the president of Italy's National UFO Centre. He has written many books about UFOs and his home in the centre of Florence is stuffed full of alien memorabilia, posters of old Italian B-movies, framed newspaper articles and black-and-white photographs of blurry flying saucers. "The players and the public were stunned seeing these objects above the stadium," Pinotti says. "At the time the newspapers spoke of aliens from Mars. Of course now we know that is not so - but we may conclude that it was an intelligent phenomenon, a technological phenomenon and a phenomenon that cannot be linked with anything we know on Earth." He's also intrigued by the material that fell from the sky - what Magnini describes as silver glitter. Image caption "A wave of flying saucers over Italy," reported the Domenica del Corriere three years later. With thanks to the Fondazione Corriere della Sera for the use of material from their historic archives. "It is a fact that at the same time the UFOs were seen over Florence there was a strange, sticky substance falling from above. In English we call this 'angel hair'," says Pinotti. "The only problem is after a short period of time it disintegrates." As a 10-year-old-boy he witnessed this phenomenon himself. "I remember, in broad daylight, seeing the roofs of the houses in Florence covered in this white substance for one hour and, like snow, it just evaporated. "No-one knows what this strange substance has to do with UFOs." Variously described by witnesses as similar to cotton wool or cobwebs, the substance was hard to collect because it disintegrated on contact - but some people were determined to find out what it was. One of them was a journalist at the Florentine newspaper La Nazione, the late Giorgio Batini. In 2003 he told an Italian television programme, Voyager, how on that day he received hundreds of phone calls about the sightings. From the offices of La Nazione in the centre of town his own view of the sky was blocked by the Cathedral, so he went up to the top of the newspaper's building to see what everyone was talking about. The 81-year-old recalled seeing "shiny balls" moving fast towards the dome of the Cathedral. The players and fans from that legendary game spoke to World Football on BBC World Service. Batini ventured out to investigate. He came across a wood outside the city that was covered in the white fluff. He gathered several samples by rolling them up on a matchstick, and took them to the Institute of Chemical Analysis at the University of Florence. When he got there he found that others had done the same. The lab, led by respected scientist Prof Giovanni Canneri, subjected the material to spectrographic analysis and concluded that it contained the elements boron, silicon, calcium and magnesium, and that it was not radioactive. Unfortunately this did not provide any conclusive answers - and the material was destroyed in the process. Could it have come from a UFO? "It's an absolutely silly idea. Science totally rejects this idea," says US Air Force pilot-turned-astronomer James McGaha. From the Grasslands Observatory in South Eastern Arizona he has spent more than 40,000 hours staring at the night sky. Not to mention the additional hours he's spent in the cockpit of US fighter jets. "You know the whole UFO phenomenon is nothing but myth, magic and superstition, wrapped up in this idea that somehow aliens are coming here either to save us or destroy us," he says. In McGaha's view, the whole spectacle, "angel hair" and all, was nothing more than migrating spiders. "When I looked at this case originally I thought perhaps it was a fireball, a very bright meteor breaking up in the atmosphere. They can be cigar-shaped with pieces breaking off. But it became fairly apparent that this was actually caused by young spiders spinning webs, very, very thin webs. "The spiders use these webs as sails and they link together and you get a big glob of this stuff in the sky and the spiders ride on this to move between locations. They just fly on the wind and these things have been recorded at 14,000 feet above the ground. So, when the sunlight glistens off this, you get all kinds of visual effects. "As some of this stuff breaks off and falls to the ground, this all seems magical of course," says McGaha. "But I'm fairly confident that's what happened that day." This theory is backed up by the fact that September and October are the months when spiders in the northern hemisphere migrate - and spectacular spider migrations still make headlines today. But it hasn't convinced everyone. "Of course I know about the migrating spiders hypothesis - it's pure nonsense. It's an old story and also a stupid story," says Pinotti. He disputes the spider theory because of the chemical analysis of the "angel hair" samples. Spider silk is a protein - an organic compound containing nitrogen, calcium, hydrogen and oxygen - not the elements reportedly found in the samples Batini and others brought to the university. Sixty years on, the chances of determining the cause of the incident are slim. "I wouldn't trust any reports of an old and strange event like this unless I'd seen the data," says science writer Philip Ball. He agrees that the elements said to have been observed in the "angel hair" don't seem to tally with the spider theory. "Magnesium and calcium are fairly common elements in living bodies, boron and silicon much less so - but if these were the main elements that the white fluff contained, it doesn't sound to me as though they'd come from spiders," he says. So it all remains a mystery. No matter what the scientists say, those who were there are convinced that what they saw was unlike anything on earth. Romolo Tuci just feels lucky to have been there. His eyes dance excitedly as he remembers that curious day. "I was spell-bound and I was also so, so happy." Listen again to the Mystery of the Fiorentina UFOs as featured on World Football on BBC World Service.